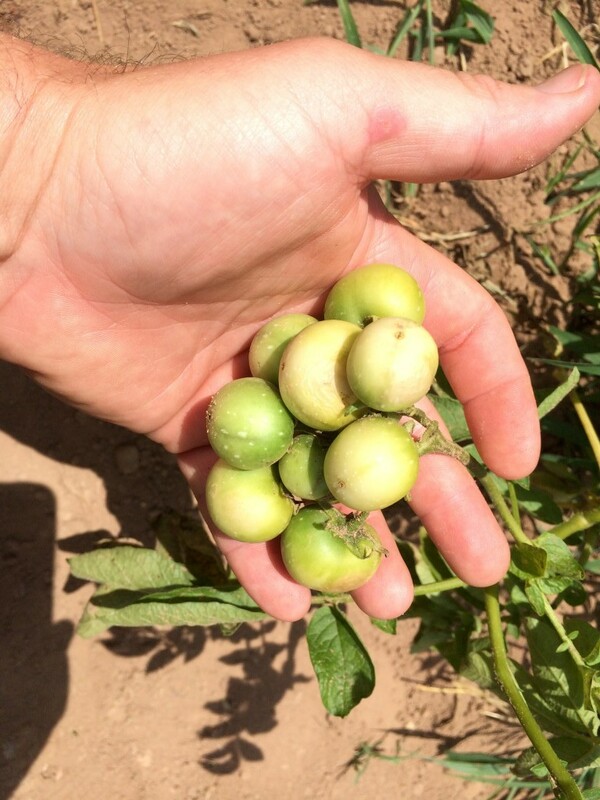 Cultivating Cherokee County | Fruit on Potatoes? I got a call this week from a gardener, Mr. Steve Dendy, in Woodstock who said he has something I might want to see. His spring potatoes had begun to produce little fruits that looked like tiny tomatoes. He assured me that he had been gardening a long time and his 89 year old uncle even longer and the two of them had never seen anything like this before. 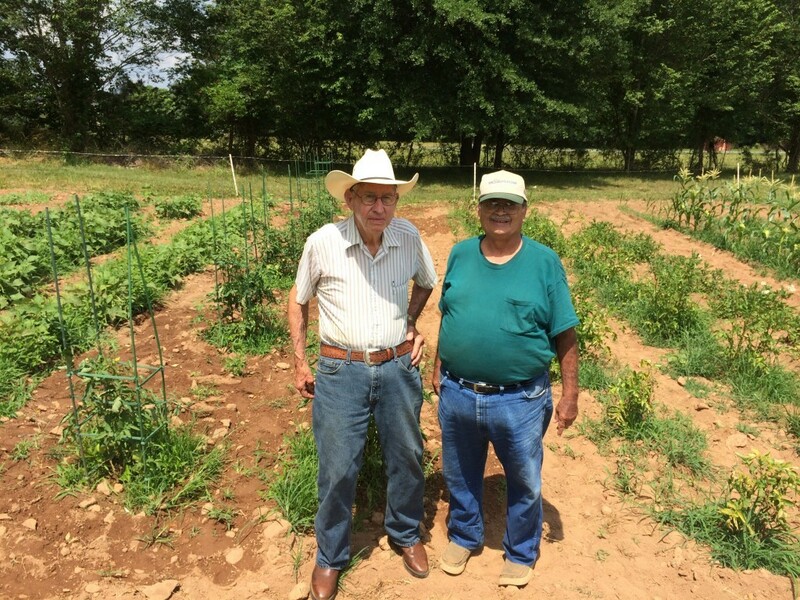 Mr. Charles Byrd on left and Mr. Steve Dendy on right have over 100 years of gardening experience between the two of them and had never seen fruits on potatoes. 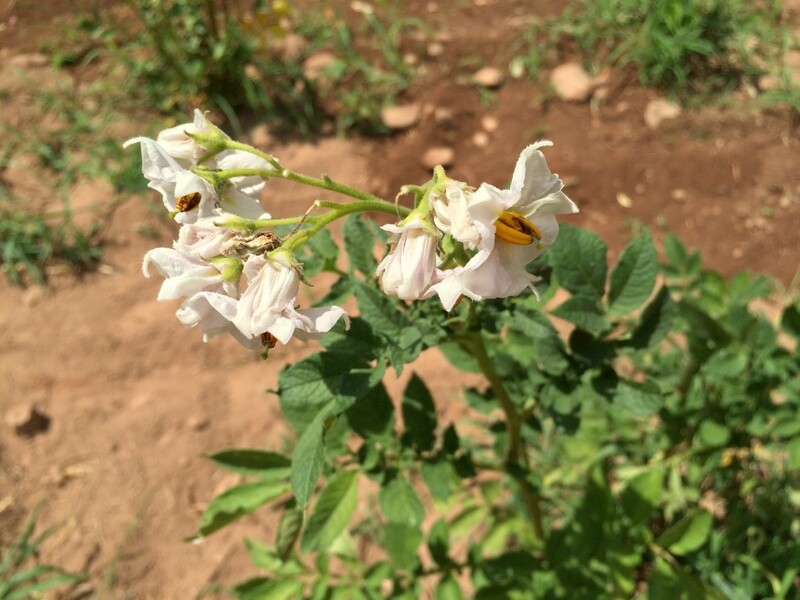 I had seen potato flowers before and knew the plant belongs to the nightshade or solanacea family along with tomatoes, eggplant, and peppers but had still never seen actual fruits follow the flowers. I went out today to witness the rarity and help Mr. Dendy’s uncle, Mr. Charles Byrd identify what was happening to his tomato plants. The potato flower clusters resemble a tomato but are typically white or lavender instead of yellow. The fruits of potato are not edible and like most of the nightshade plants, the fruits are poisonous. The toxicity comes from a plant compound called solanine, which can lead to headaches, abdominal pain, shock and diarrhea. Solanine is also found in potatoes that the skin has turned green due to too much sun/light exposure. Fruit cluster from potatoes resemble a bunch of cherry tomatoes. If you have children in your garden you may want to remove the clusters so they don’t confuse them with tomatoes and unknowingly taste them. Removing them will not harm the plant or development of the tubers. One could save the ripe seeds inside the potato fruit but you would not get the same kind of potato as the parent plant. I would also take several years to grow the plant to a size that you could harvest the tubers. More information on growing potatoes in Georgia can be found in this great publication. Posted in Cherokee County, Home Gardening, Potato, Tomato, Vegetables. This entry was tagged fruit on potato, home gardening, potatoes, Vegetables. Bookmark the permalink.